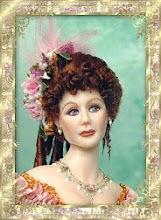 Today, we will look at several factors when costuming a miniature doll. Please click on photos for a slightly larger view. 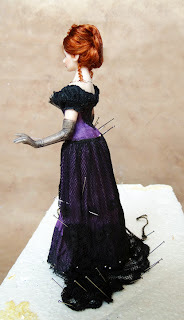 Here are more photos of Chantelle as the draping of her skirt continues. As you can see, I use a lot of pins in the process. 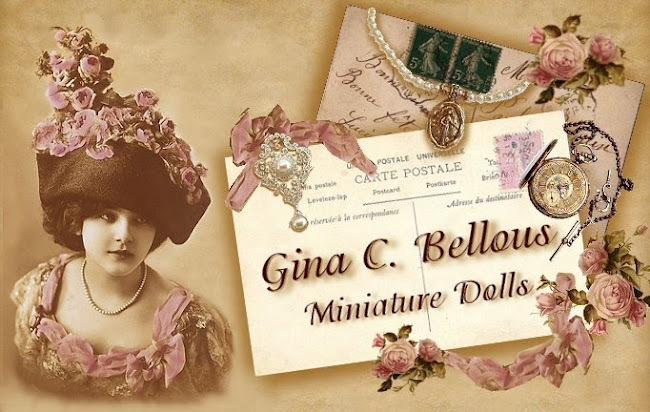 These pins happen to be long silk pins, but there are even finer pins out there. They are insect pins. I find that these finer silk or insect pins work great to keep the pin holes to a minimum or just very small. 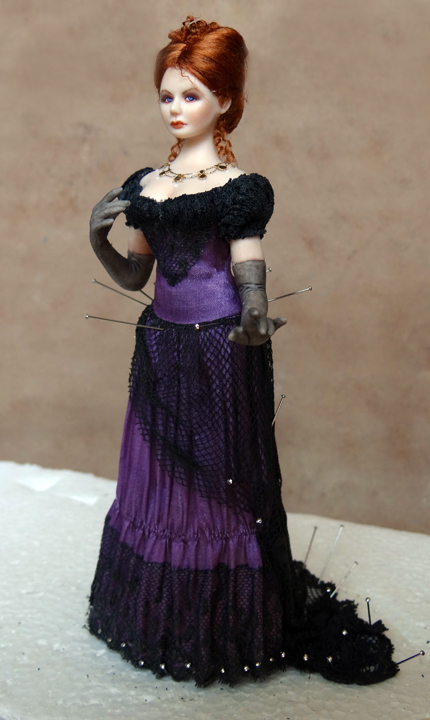 As you can see, I have re pinned and kept the pins in the bottom of Chantelle's skirt. 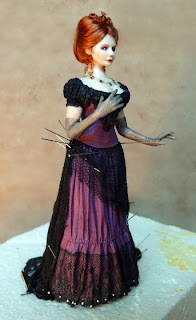 From now on, until she is finished she will remain pinned to the Styrofoam. This is to insure that all of the hard work of draping her skirt will not be lost every time I spray or re-spray a part of her costume. 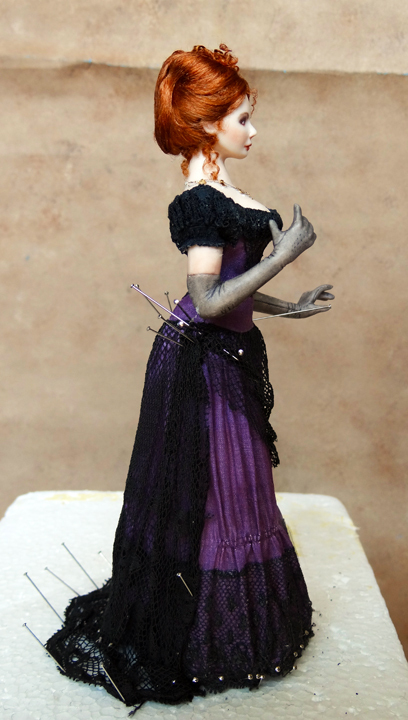 I had to scrap the original gorgeous lace I intended to use for her over skirt as it was just too heavy and out of scale. Scale is of utmost importance in miniatures. If you want the costume to be believable then you must use the proper fabrics and trims. Color really also comes into play when considering scale. Remember, earlier, I mentioned that the trims are all a dark charcoal color but they certainly read as black, don't they? True dark black was just too much of a contrast with the amethyst color I chose so the charcoal plays well, fits the scale and adds an aire of elegance and richness rather than looking cheap, which can happen if the scale is not correct. I had a great piece of antique lace that was just big enough (and long enough) to make the lace overlay skirt I was envisioning for her costume. It was also perfect because it was sheer and airy and does not hide all of the hard work I put into draping the underskirt. You want to be sure that the lace overlay also drapes nicely, and does not stick out funny or hide what is underneath it. Now let's talk about your doll's posture. Can you see how regal Chantelle looks? She is slightly bent forward, causing her back to sway a bit but her chest is held high. She is not merely standing there. She already displays an attitude which goes well with that look on her tiny face. I have always been drawn to that "look" on her face. I think that is why I kept her back to costume rather than sell her as a kit. She seems to have so much life in her. I see a whole story unfolding when I look at her. This is a woman who perhaps has her eye on a gentleman at a party and is not happy with the attention he is lavishing on a woman she considers her competition. "Game on! ", Chantelle is not going to stand by and watch her would be suitor slip away. Do you see how having a vision, story, etc. 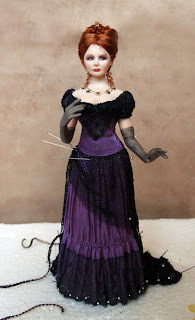 can really help the doll and her costuming come to life? Next I will be adding all of those fine details and trims that will make this a special gown. Gina, I love reading about your 'design process!' What an elegant creation Chantelle is turning out to be!